At PC LAN, we offer the BEST price for HPE New ProLiant ML110 Gen10 Series. Are you searching for a tower server with exceptional value to meet the requirements of your small-to-midsized business? 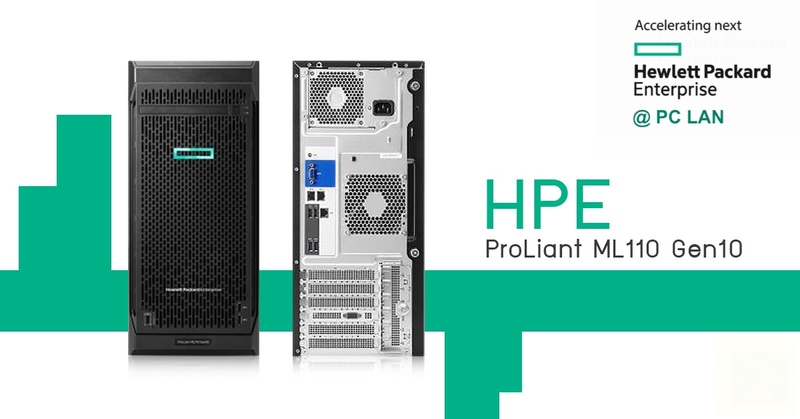 The HPE ProLiant ML110 Gen10 server is an enhanced tower with performance, expansion, and growth at an affordable price. It meets most small- and mid-sized businesses’ needs as well as accelerates your business compute. The ProLiant ML110 Gen10 is a single processor tower form factor that can also be placed in a rack server cabinet using 4.5U of rack space. It includes up to five PCIe slots with room to grow with eight large form factor (LFF) or 16 small form factor (SFF) disk drives. It provides six DDR4 DIMM slots supporting HPE DDR4 SmartMemory with a maximum capacity of 192 GB. The HPE ProLiant ML110 Gen10 server also offers optional redundant fan and redundant power supply to satisfy automatic fail-over needs, making this the ideal server for small- to mid-sized businesses and remote offices and branch offices.